Arion Phono Preamp - Musical Magic! Announcing our award-winning phono stage, the Arion. This collaboration with Luminous Audio Technology was very well received at the Capital Audiofest 2015 by reviewers and individuals alike. Its design is based on 35+ years of knowledge and experience by engineer Mike Bettinger. Technical information follows the reviews below. If you have any questions at all, please email us (mike@bettingeraudiodesign.com) or call (804-317-9118, 8am-7pm, EDT). We're here to help you! We are so proud that our Arion earned Everything Audio's 2015 Product of the Year Award! Luminous Audio Technology’s Arion is a superbly engineered and built solid-state phono preamplifier that manages high resolution, outstanding transparency, impressive bottom end extension and grip, a velvety midrange, and an overall tonal neutrality that makes it easy to recommend. Most importantly, top to bottom, it all holds together to produce a unified sonic statement. It has no fundamental weaknesses...I don’t know if Luminous offers a money back guarantee, but if you’ve got a budget for a phono preamplifier of around $6500, the Luminous Audio Arion should definitely be on your “to hear” list. I’ve enjoyed the more than eight months I’ve had it in my audio system and if you’ve listened to this week’s radio show, I’m sure you’ve enjoyed it as well. I have come across many audiophiles who have truly splendid turntables, tone arms, and cartridges, of which cost them an arm and a leg. Nevertheless, they still may not enjoy the best that vinyl has to offer if the bottleneck in their audio arsenal is their phono preamplifier. There is no doubt that the phono preamplifier plays a crucial part in the analog chain and the very best of this breed takes some serious coin to acquire. This could be the reason why, in so many vinyl rigs, the phono preamplifier is usually the weakest link. So I am always delighted whenever I happen upon any phono preamplifier that delivers sonic performance that is reasonably close to state-of-the-art but at a price that not stratospherically out of reach. When Dr. David Robinson, the Editor of PF offered me the opportunity to review the Arion, a phono preamplifier designed by Luminous Audio Technology, I jumped at the chance. I have heard good things about this unit and was curious to find out for myself if it deserved the buzz it had been getting. Tim Stinton of Luminous Audio Technology had a bit of a problem prying the Arion review unit out of the hands of the previous reviewer but eventually managed to get it to me. Having already been through the hands of a couple of reviewers, the Arion unit was already fully broken in, and so I could get down to the business of reviewing it without having to bother breaking it in. However, before the formal audition I read through the unit's white paper and found it quite fascinating. To design a phono preamplifier with superior performance without the uber high price tag, Mike Bettinger, the designer, had to think outside the box, break a few hitherto accepted design parameters, and challenge conventional thinking. Hitherto, many high-end and exorbitantly priced phono stages have offered a balanced circuit design. Mike decided to go against this ‘conventional' thinking and adopt a single-ended design instead. His rationale; the signal provided by the cartridge is not balanced as many in the industry claim, so a pseudo ground needs to be created to reference the cartridge output to create a positive and negative signal. To create a balanced output, the phono preamp has to equalize and amplify the signal through two identical preamp and equalization circuits. Given this state of affairs, Mike decided that not much is to be gained from adopting the balanced design and so he decided to go the simpler single-ended route for the Arion. This allowed him to use his understanding and experience with the intricacies of circuit layout and execution of audio amplification circuitry to successfully reference the cartridge to a clean ground thereby allowing the Arion to maintain the signal integrity of the cartridge output. For the Arion, Mike decided on a two-stage design with a cascoded discrete JFET input stage followed by a differential cascoded JFET second stage and then using servos to provide stability. The equalization is supplied by a passive and active RIAA network working in combination. The power supplies comprise instrumentation amplifier based designs. Special attention was paid to the circuit layout to optimize the purity and low-level detail resolution of the sound signal. On the preamp side, Mike was determined to give the Arion a circuitry that has an environment that is as fast and quiet as possible so as to attain the maximum possible speed and resolution. To achieve this Mike implemented the grounding and supply networks with careful consideration of both; the circuit biasing and signal return currents featuring controlled signal and biasing references coupled with distributed capacitance power feeds and bypassing technology. Mike then fine-tuned the operating points of the active devices to their sweet spots; which in essence would be akin to voicing the unit. 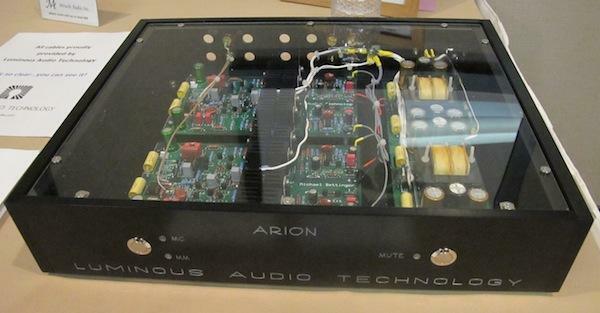 minous Technologies chose to depart from the convention of putting the signal processing circuitry and the power supply into separate chassis with the rationale that their unique design and extra attention to shielding allowed the Arion to deliver similar results to that of a separate chassis configuration. They claim that the single chassis brings down production costs quite exponentially. Those savings are then passed on to the customer via a more affordable price. I began the review with Dave Brubeck's Blues Roots featuring Gerry Mulligan. On the "Limehouse Blues" track what immediately jumped out at me was the incredible focus, stability, and solidity of the sound stage. I could very easily locate every instrument, and the air around each of them came surprisingly close to what I usually perceive at a live performance. The leading edges were very well defined and the decay was as accurate as I have heard from any phono stage at this price point. Another standout was the noise floor, which was so incredibly low; it did not obscure even the very low level details, subtleties, and nuances in the music during the softer passages. Next up I put on Stevie Ray Vaughan's "Tin Pan Alley" from the album Couldn't Stand The Weather. I can't remember when I enjoyed Stevie's magical guitar work more! Also, his distinctive voice had the body and presence that made it very easy to imagine that he was in the room with me. With Patricia Barber's Café Blue album, I cued up "Nardis" and I was blown away with Patricia's voice that was so hauntingly beautiful I felt my eyes moisten. The percussion rendition on this track was also delivered with the same crisp, taut realism and slam that I had onky previously heard with mega-buck phono preamplifiers. Having played the piano for a rock band I know, first hand, how difficult it is to reproduce the sound of this incredibly versatile instrument. At the hands of a master, few instruments can express emotion as well as a piano. With the Arion, that was not a problem. The piano notes were rendered very well indeed. On Diana Krall tracks, the Arion made it easy to visualize the felt lined hammers striking the strings. With all genres of music the Arion delivered a midrange that was smooth as a baby's bottom and very well textured and saturated. The highs were silky and luscious with a level of sweetness that is quite seductive. The bass was tuneful and authoritative with just the right amount of punch. On well-recorded tracks, the sonic image delivered by the Arion was quite holographic. The timbre and tonal balance from the top to the bottom of the audible frequency spectrum was impressive to say the least. Dynamic contrast was also very commendable. At this price point I have heard phono stages that extract more detail from vinyl records, but few of them have the sheer musicality of the Arion. It somehow manages to expertly straddle that elusive thin line between analytic and musical with aplomb. This gives it a very low fatigue factor. I had many very long listening sessions using the Arion and at no time did I feel fatigued in any way. The Arion's price can hardly be categorized as inexpensive, but there are many aspects of its sound reproduction that you would only find in phono preamps that carry much higher price tags. This makes the Arion a must audition if you are in the market for a phono preamp with a budget of around $9000. If you already have a great turntable, tone arm and cartridge, but suspect that your phone stage is holding the sound quality back, you would be well advised to give the Arion a serious audition. You could well discover that, by upgrading to the Arion, your phono stage transforms from a weak link to one of the stronger performers in your analog playback system. Last but hardly least requires a quarter-turn over to Bettinger Audio Design. Mike Bettinger is the guy behind the clever audio guts of the spectacularly-well-received new Arion phono stage ($6,500 — a joint venture with Luminous Audio). I have one of those latter here and will offer that Michael Fremer nailed the character of that phono pretty spectacularly; I think it is one of the very best solid-state phono preamplifiers on the market today. Sonically, this room was harder to get a handle on. Not because things weren’t smooth and refined — there were too damn many people wandering about to do more than browse. Like I said, it was a very popular room. But what I did hear? I think these guys are on to something. I dig the aesthetic. I dig the artisanal approach. And I want more. "And me being "me," I swear I could listen through the system to study and admire the contribution of the excellent Arion phono preamplifier by Luminous Audio ($6395). It seemed like such a spot-on trusty servant that delivered up healthy scoops of musical art, texture and audio science. (There is a reason Harry Weisfeld was using an Arion to show off his and Mat's new creations for VPI.)" If you are a vinyl stalwart with a bit of disposable income, the VPI Scout 1.1 and Luminous Audio Arion are two worthy candidates for purchase. If you are moving up, or even as a first turntable system purchase, it might be the last vinyl system you need to buy. An Everything Audio Network Stellar Sound Award for each component and a nomination for our 2015 Gear of The Year. The entire time I was auditioning the ARION, I was under the impression it was $13,000. I was stunned to find out it was less than half of that! I found it amazingly quiet, dynamic and almost too detailed. But, is that possible? “The Luminous Audio Arion phono preamp is a gem! It punches way above its weight and compares favorably with phono preamps costing 2-3 times its price. Its build quality is first class, its ability to resolve complex details is impeccable, and its musicality is second to none. At its price, it is one of the best values in high-end audio. "Luminous Audio debuted a new phono stage, the Arion, designed by Mike Bettinger of GAS Audio. I heard Luminous gave Mike a no limit cost budget to design the best phono stage he could, the result sounded wonderful in their room. The Arion was fed by one of the many VPI tables at the show, this one a special prototype Classic Direct, direct drive incorporating a magnetic floating feature that will come at sincere coin. This room was always filled and with good reason, the vinyl spun by Ralph made me smile and tap my fingers and feet, I visited this room many times to just relax and enjoy." The Luminous Audio Arion is a well designed, well built, hassle free phono preamplifier that made it clear that my records were capable of conveying more musical information more pleasurably than I had thought possible. It is a resounding success, and will probably be my next audio purchase. That it is a product of friends is icing on a very yummy cake. 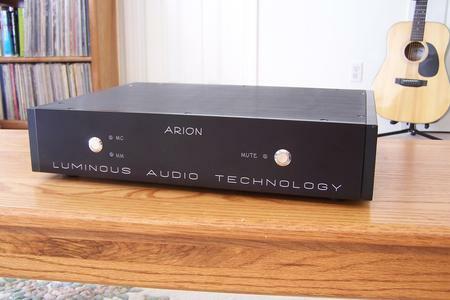 Mike and Lynn have a new venture as Mike has designed a killer phono preamp, the Arion (http://www.bettingeraudiodesign.com/arion-phono-preamp/). I can't tell if Mike was more excited to show it off or I was more excited to hear it, perhaps we tied on that one. So, we fell back on old ways and did a bit of serious listening. I was treated to the best-sounding vinyl record experience I've ever had. If anyone doubts how good vinyl can sound, they need to hear this preamp in action. The entire signal chain was solid-state, but the sound was smooth and engaging. More important, the clarity and complete lack of any distortion was a revelation. Vocals, in particular sounded incredibly warm in a natural way, not overly warm as with some tube amps, but just dead on. Chorus vocals sounded really distinct, something I rarely hear. The bass melded the best qualities of solid state and tubes, being fluid, impactful but in no way overpowering. I tend to be a fan of digital reproduction, but no digital system I've ever heard sounded this natural. Now, I know that most people aren't audiophiles. The world tends to view us as being a bit obsessed. But I think that anyone who really loves music owes it to themselves to hear what is hiding on their albums and CDs. When the noise and distortion go away, the emotional content of the music is revealed in a way that makes even the most familiar of songs or other works a new and more fulfilling experience. People like Mike and Lynn care deeply about the music and we all benefit from their efforts. I'm proud to have them as friends. The Luminous Audio Technology Arion Phono Preamplifier is the result of over 35 years exploring the boundaries of state-of-the-art audio technologies. The circuitry is an assemblage of the best sounding building blocks available for audio circuit design; meticulously identified through years of study, observation, research, prototyping and listening. 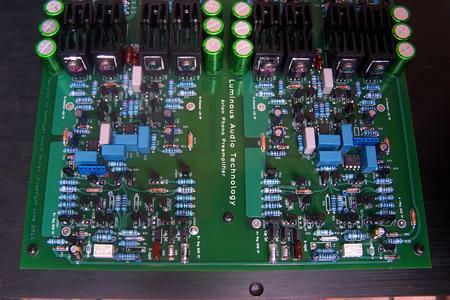 We use thru-hole vs. surface mount technology for better sound and reliability. The creation of this preamp has more in common with the creation and voicing of a fine musical instrument than a theory-derived amplification circuit. The purity and low level detail retrieval it provides is groundbreaking and reflects its unique lineage. call to 804-317-9118 audition or buy!